The broader mission is to provide customers with a large catalogue of the latest products geared at satisfying their every need from technology, home and living, sports and outdoor to beauty and health and anything in between. As a Skymart, our combined mission will be to help bring the products currently offered by your store to the final consumer. Together, the Parties enter into this Partnership agreement to afford the seller (here by the SkySeller) a platform to access the website (here by Skymart.bw) and use the services to sell their products. BY REGISTERING FOR AND USING THE SERVICES, YOU AGREE TO BE BOUND BY ALL TERMS AND CONDITIONS OF THIS PARTICIPATION AGREEMENT, AND ALL POLICIES AND GUIDELINES OF THE SITE ARE INCORPORATED BY REFERENCE. Skymartbw Proprietary Limited (“Skymartbw,” “we”) reserves the right to change any of the terms and conditions contained in this Participation Agreement or any policies or guidelines governing the Site or Services, at any time and in its sole discretion. Any changes will be effective upon posting of the revisions on the seller dashboard and after an email notification. All notice of changes to this Participation Agreement will be posted on the Site for thirty (30) days. You are responsible for reviewing the notice and any applicable changes. Changes to referenced policies and guidelines may be posted without notice to you. Your continued use of the website and the services following posting of changes WILL CONSTITUTE YOUR ACCEPTANCE OF SUCH CHANGES or modification. If you do not agree to the changes on the website, please notify the sky team or discontinue use of the website or the services. Use of the Site and Services is limited to parties that lawfully can enter into and form contracts under applicable law. You represent and warrant that: (a) if you are a business, you are duly organized, validly existing and in good standing under the laws of the country in which your business is registered and that you are registering for the Services within such country; (b) you have all requisite right, power and to enter into this Participation Agreement and perform your obligations hereunder; and (c) any information provided or made available by you or your affiliates to Skymartbw or its affiliates is at all times accurate and complete. Listing and registration fees are 100% free. There are no hidden fees and any fees that may arise will be communicated and agreed upon between the SkySeller and Skymartbw before taking effect. The SkySeller is to pay an 8.5% commission on the revenue received from sale on the website, with the 91.5% commission payable to the seller within 7 working days. You agree to abide by the procedures and guidelines–contained in the Help section–for conducting fixed price sales, which are incorporated by reference into, and made part of, this Participation Agreement. We may change these procedures and guidelines in the future, and such changes will be effective immediately upon posting without notice to you. You will not send customers emails concerning confirmation of any order placed through the website, nor will you get in direct contact with the customers through our website. No contact information (cellphone number or email) will be displayed on your store page. Promptly after shipment of a customer’s order (or any portion of the customer’s order), you will accurately inform us that the order has been shipped (and, in the case of a customer order that is shipped in more than one shipment, accurately inform us which portion of the order has been shipped), using our standard functionality for communicating such information when we make that functionality available to you (“Confirmation of Shipment”). If you fail to provide Confirmation of Shipment within the time frame specified by us (e.g., same day or day after the date an order was placed), we may in our sole discretion cancel (and/or direct you to stop and/or cancel) any such transaction, and you will stop and/or cancel any such transaction upon such request by us. 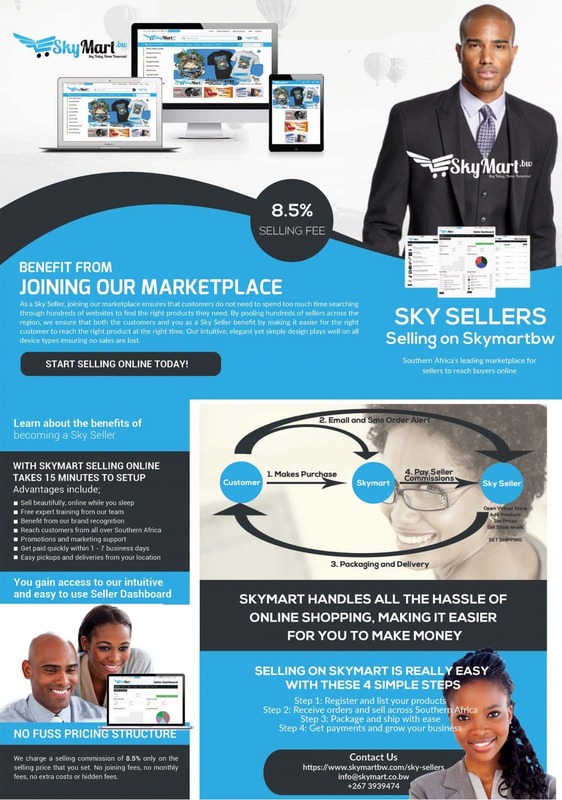 Skymartbw provides a platform for third-party sellers (“SkySellers”) and buyers (“Buyers”) to negotiate and complete transactions. Skymartbw is not involved in the actual transaction between SkySellers and Buyers. As a SkySeller, you may list any item on the Site unless it is a prohibited item as defined in the procedures and guidelines contained in the Help section, or otherwise prohibited by law. Without limitation, you may not list any item or link or post any related material that (a) infringes any third-party intellectual property rights (including copyright, trademark, patent, and trade secrets) or other proprietary rights (including rights of publicity or privacy); (b) constitutes libel or slander or is otherwise defamatory; or (c) is counterfeited, illegal, stolen, or fraudulent. It is up to the Seller to accurately describe the item for sale. As a Seller, you use the Site and the Services at your own risk. By registering for or using the Services, you authorize Skymartbw Proprietary Limited (“Skymartbw”) to act as your agent for purposes of processing payments, refunds and adjustments for Your Transactions (as defined below), receiving and holding Sales Proceeds (as defined below) on your behalf, remitting Sales Proceeds to your bank account, and paying amounts you owe in accordance with this Participation Agreement or other agreements you may have with Skymartbw or its affiliates (collectively, the “Transaction Processing Service”). “Sales Proceeds” means the gross proceeds from any of Your Transactions, including all shipping and handling, gift wrap and other charges, but excluding any taxes separately stated and charged. “Your Transaction” means any sale of your items through the Site. When a Buyer instructs us to pay you, you agree that the Buyer authorizes and orders us to commit the Buyer’s payment to you (less any applicable fees or other amounts we may collect under this Participation Agreement). You agree that Buyers satisfy their obligations to you for Your Transactions when we receive the Sales Proceeds. Our obligation to remit funds received by us on your behalf is limited to funds that we have actually received less amounts owed to Skymartbw, subject to chargeback or reversal or withheld for anticipated claims in accordance with this Participation Agreement. We may at any time require you to provide any financial, business or personal information we request to verify your identity. SkySeller will not impersonate any person or use a name he or she is not legally authorized to use. SkySeller authorizes us to verify his or her information (including any updated information), and authorizes Skymartbw, incase of a legal dispute, the right to disclose such information. Skymartbw retains the right to determine the content, appearance, design, functionality and all other aspects of the Site and the Services (including the right to re-design, modify, remove and alter the content, appearance, design, functionality, and other aspects of the Site and the Service and any element, aspect, portion or feature thereof, from time to time), and to delay or suspend listing of, or to refuse to list, or to de-list, or to require Seller not to list, any or all products in our sole discretion. By entering into this Participation Agreement and posting a listing for fixed price sale, you agree to complete the transaction as described by this Participation Agreement. You acknowledge that by not fulfilling these obligations, your action or inaction may be legally actionable. All returns, refunds and adjustments in accordance with this Participation Agreement and the Skymartbw return policies published on the Site and the SkySeller store at the time of the applicable order, and other policies thereby published in your store shall apply to your products. You will promptly provide refunds and adjustments that you are obligated to provide under the applicable Skymartbw return policies and as required by law, and in no case later than twenty (20) working days after the obligation arises. Your password may be used only to access the Site, use the Services, electronically sign Your Transactions, and review your completed transactions. You are solely responsible for maintaining the security of your password. You may not disclose your password to any third party (other than third parties authorized by you to use your account) and are solely responsible for any use of or action taken under your password on this Site. If your password is compromised, you must change your password. Skymartbw reserve the right to report any activity that either of them suspects violates any law or regulation to appropriate law enforcement officials, regulators, or other third parties. In order to cooperate with governmental requests, to protect Skymartbw’s’ systems and customers, or to ensure the integrity and operation of Skymartbw’ business and systems, Skymartbw may access and disclose any information it considers necessary or appropriate, including but not limited to user contact details, IP addressing and traffic information, usage history, and posted content. ANY OBLIGATION, LIABILITY, RIGHT, CLAIM, OR REMEDY IN TORT, WHETHER OR NOT ARISING FROM THE NEGLIGENCE OF SKYMARTBW PROPRIETARY LIMITED. TO THE FULL EXTENT PERMISSIBLE UNDER APPLICABLE LAW, SKYMARTBW DISCLAIM ANY AND ALL SUCH WARRANTIES. Skyamrtbw is not an agent of SkySeller and is not the agent of Buyer for any purpose, therefore will not act as either party’s agent in connection with resolving any disputes between participants related to or arising out of any transaction. Skymartbw urges Sellers and Buyers to cooperate with each other to resolve such disputes. If any provision of this Participation Agreement shall be deemed unlawful, void, or for any reason unenforceable, then that provision shall be deemed severable from these terms and conditions and shall not affect the validity and enforceability of any remaining provisions. The term of this Participation Agreement is for a period of insert length of partnership depending from the effective date of this Agreement and may be extended upon written mutual agreement. Either party may terminate the partnership at any time without penalties or liabilities. This Agreement shall be construed, interpreted and governed in accordance with the laws of Botswana and should any provision of this Agreement be judged by an appropriate court as invalid, it shall not affect any of the remaining provisions whatsoever. The signing of this Participation Agreement is a formal undertaking. It implies that the signatories will strive to reach, to the best of their ability, the objective stated. On behalf of the Company I represent, I wish to sign this Participation Agreement.